Posted on June 14, 2010, 2:53 pm, by E gan F, under Art. 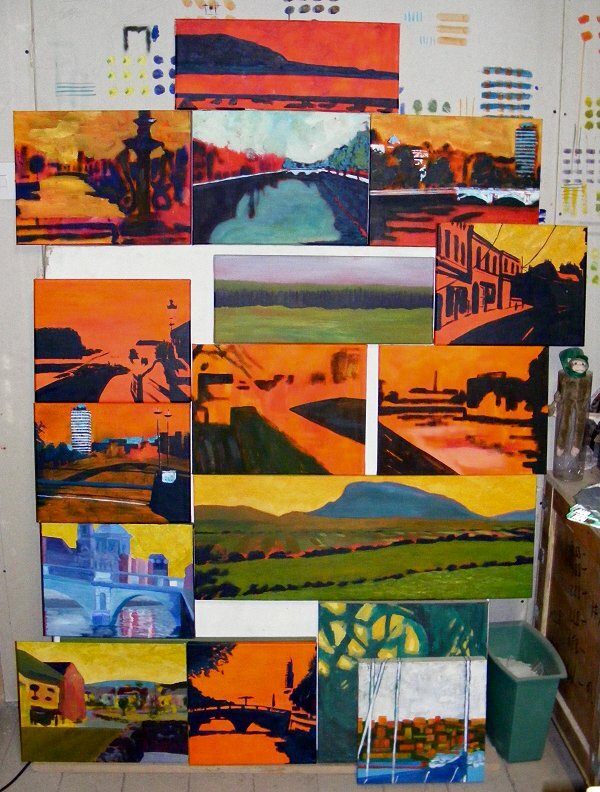 Some paintings in progress at the moment. Some have been on the go for some time and are long overdue, others are more recently started. With momentum restored, all should now be coming to completion shortly. Next exhibition is on June 25-27 2010 at the People’s Art on Stephen’s Green, Dublin. Your beginnings are more pleasing to me than some artists’ finished work. Ha! I’m with you; some of my pots looked so much better in my head than they did coming out of the kiln. Am working on a landscape series. Landscapes made by dipping and pouring glazes on bisqued pots—plates & mugs so far. I’ll email you either pictures or a link to pictures at some point. Like you, I’m getting ready for a show coming up in July.